Joe Wiebe was born in 1909 in Greenland, Manitoba in the Holdeman Mennonite Community. He was the eighth child born into the Peter H. Wiebe family. As a young child Joe had a temper and by the time he was 10 years old was robbing stores. This led to many years of thieving and drunkenness. When Joe was 22 years old he was invited to a church service. Joe accepted the Lord as his personal saviour. Shortly thereafter Joe chose to stay home and help care for his father who was battling cancer. In 1936 Joe left home and went to Winnipeg to study at the Winnipeg Bible Institute (now known as Providence College). During this time he renewed his acquaintance, and corresponded with his old friend Marie. Marie Toews was born April 1, 1912 in Steinbach, Manitoba. She was the tenth of 15 children born to Peter R. and Elizabeth Toews. When she was 12 years old her mother died. This left a void in Marie’s life and when she was 15 years old she left to find work and happiness in Winnipeg. While in Winnipeg Marie rebelled against her Mennonite heritage and upbringing, but when she was 18 years old she made her peace with God and returned to Steinbach. She went back to high school and was able to complete two grades within 6 months. The summer after her graduation, Marie left for Saskatoon where she lived with her brother Peter Toews and his wife Teen. She stayed there for four years working for the T. Eaton Co. in the food and catering department. Eaton’s wanted to send Marie for further training but Marie decided to attend the Bible School in Saskatoon. She was there for two years, during which she renewed her relationship with Joe Wiebe. Their relationship grew strong and in order to be closer to Joe, Marie moved to Manitoba and finished her training at the Winnipeg Bible Institute. On August 3, 1938, after many letters, much prayer and preparation, they were married. They settled in Steinbach and had two children, Eunice and Ruth. Joe became sick for a period of three years and he contributes his recovery to the revival happening in his community. After he became well Joe and Marie heard God’s call for full-time service. They waited and prayed, open to wherever the Lord might need them. In 1943, through the Christian Endeavor Society (composed of six Mennonite Churches, including the Mennonite Brethren Church in Steinbach), Joe and Marie found themselves church planting in Stuartburn, South Eastern Manitoba. They stayed for three years during which they had another daughter Lois and a son Phillip. At the end of three years the Lord directed them to the Interlake and they found themselves settling in the Ashern area. Joe’s first convert was Teen Noordenbus and their fifth child, David, was born here. Their time as missionaries was quite demanding, besides raising a family, Joe and Marie opened their hearts and their homes to the people around them. They were known for their singing and their hospitality, and often had a house full of people. After 14 years of dedicated missionary service, Marie became exhausted and the doctor ordered a long rest, one year at least. So in 1957 the family returned to Steinbach. Joe found work at the local creamery and they joined the Steinbach Mennonite Brethren Church. It was a time of transition as the family got used to living in an urban environment, rested more than they served and the girls all met the men they would later marry. After two years the Wiebe’s felt rested and the doctor gave his permission for them to return to the work they loved so much. Joe and Marie were called to minister at Lindal Church in the Pembina Valley and so they moved to Morden, Manitoba. The work was different than what they had experienced before in that the church was already established with a congregation open to hearing their message. When their work at the Lindal Church was over Joe accepted the position of Administrator at The Tabor Home in Morden. After a year, the Mission Board suggested a new assignment for Joe and Marie in Winnipegosis. Most of their children had married and it was during this time that their daughter Eunice died of cancer, leaving behind a husband and three young children. It was also during this time that they began conversations with the Foreign Mission Board regarding an assignment in Mexico. In 1968 they left for a short, four month assignment, to work with a number of Mennonite communities that were located there. They returned to Winnipegosis expecting to continue their work there. But in 1969 Joe suffered his first heart attack and they were forced to scale-down their ministry. From 1969 onwards Joe and Marie lived in Winnipeg. They found an apartment in the West End and joined Portage Avenue Mennonite Brethren Church. Joe went to work as a visitation pastor and hospital chaplain for the Mennonite Brethren Conference, and Marie was there to assist him. In 1983 Marie had her first heart attack and after two years of failing health, Marie died on April 12, 1985. Joe continued on alone until his death April 17, 2001. In 1977 Hedy Durksen published a biography entitled “Along highways and hedges : the story of Joe and Marie Wiebe.” There are two copies available in the J.A. Toews Library. This collection was donated to CMBS in 2007 by David Wiebe, Joe’s son. The material in this collection consists of memoirs, sermon notes, diaries and correspondence of Joe and Marie Wiebe. They describe the lives, work and thoughts of a Mennonite Brethren family working for the Manitoba Mennonite Brethren Conference Home Missions Program in the Interlake, Manitoba. Finding aid for photographs: NP177-01. Finding aid for books: J.A. TOEWS 289.7092 W642 Dur. Description by Tamara Dyck, January, 4, 2008; updated January 20, 2011. I. Joe Wiebe series. – 1903-1994. 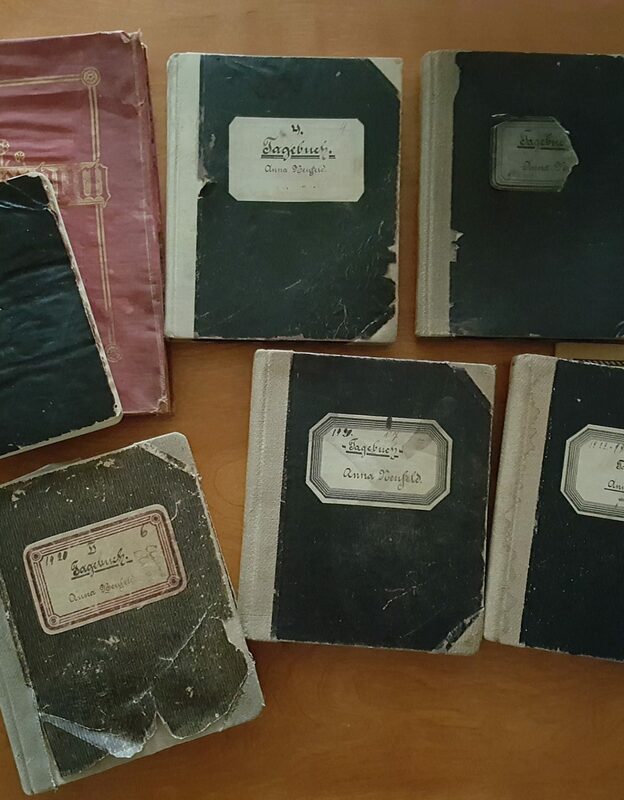 This series consists of Joe Wiebe’s memoirs, notes from school, messages he delivered, his thoughts on various topics and some correspondence. There is no apparent arrangement. Finding aid: Vol. 1131, No. 1-33; Vol. 1136, no. 44. II. Joe Wiebe sermon series. – 1946-1957. This series consists of sermons notes from Marnie, Clarkleigh, Ashern, Winnipegosis, and other locations in South Eastern Manitoba. There is no apparent arrangement. Finding aid: Vol. 1131, No. 34-58. III. Joe Wiebe sermon series. – 1959-1967. This series consists of sermon notes from Lindal, Snowflake, Tabor Home (Horndean), Morden Street and I.S.C.F. (Waldheim). There is no apparent arrangement. Finding aid: Vol. 1131, No. 59-81. IV. Joe Wiebe sermon series. – 1969-1980. This series consists of sermon notes from messages delivered at Portage Avenue Mennonite Brethren Church. There is no apparent arrangement. Finding aid: Vol. 1131, No. 82-96. V. Joe Wiebe sermon series. – 1960-1984. This series consists of miscellaneous sermons which did not fall into the above series. For example funerals, weddings and undelivered sermons. Some sermons are in German. There is no apparent arrangement. Finding aid: Vol. 1131, No. 97 – Vol. 1136, No. 9. VI. Joe Wiebe diaries series. – 1950-1990. This series consists of the diaries of Joe Wiebe. They are arranged chronologically. Finding aid: Vol. 1136. No. 10 – No. 31. VII. Marie Wiebe fonds. – 1937-1995. This series consists of Marie Wiebe’s fonds. Including memoirs, sermons, radio talks, notes, death certificate and obituary by her son Phillip Wiebe. There is no apparent arrangement. Finding aid: Vol. 1136, No. 32-42. Personal conversion and autobiographical memoirs. – [197-?]. Notes from Union Bible Study Association. – 1930-1931? Notes from Winkler Bible Institute. – 1937. The call to home mission evangelism. – [194-?]. Spiritual qualifications for visitation. – 1971. How to witness. – [194-?]. Outreach of the church. – [194-?]. Canadian Sunday School Mission and Summer Bible Schools. – 1937. Notes on the Mennonite Brethren Confession of Faith. – [19--]. Home Mission Correspondence. – 1969-1972. Message delivered to Winkler Bible School. – 1962. Correspondence and meetings. – 1964-1967. Dedication of Lighthouse Chapel, Snowflake, MB. – 1963. Architectural sketch showing addition to parsonage in Winnipegosis. – 1964. Correspondence regarding missions to Mexico. – 1967-1969. Mission trip to Mexico. – 1969. Message to Boys Brigade about transportation in mission work. – 1972. Bible study: Revelation. – [19--]. Home Mission reports to Mennonite Brethren Conference. – 1949-1979. A letter regarding “Hedges and Highways”. – 1978. Message delivered at MBCI. – 1982. Dave Wiebe’s ordination. – 1980.
Letters from acquaintances. – 1960-1994. Insurance, loan and other papers. – 1952-1953. 33a. Notes from Steinbach. – 1957-1959. 33b. Correspondence regarding the sale of church building at Menisino, Manitoba. -- 1943-1946. 34.Sermon notes: Genesis, Exodus, Joshua. – [ca. 1946-1957]. 35. Sermon notes: Psalms. – ca. [1946-1957]. 36. Sermon notes: Daniel. – ca. [1946-1957]. 37. Sermon notes: Matthew. – ca. [1946-1957]. 38. Sermon notes: Mark. – [ca. 1946-1957]. 39. Sermon notes: Luke. – [ca. 1946-1957]. 40. Sermon notes: John. – [ca. 1946-1957]. 41. Sermon notes: Acts. – [ca. 1946-1957]. 42. Sermon notes: Romans. – [ca. 1946-1957]. 43. Sermon notes: I Corinthians. – [ca. 1946-1957]. 44. Sermon notes: Ephesians. – [ca. 1946-1957]. 45. Sermon notes: James, Colossians, Thessalonians. – [ca. 1946-1957]. 46. Sermon notes: Hebrews. – [ca. 1946-1957]. 47. Se rmon notes: Jude. – [ca. 1946-1957]. 48. Sermon notes: Revelation. – [ca. 1946-1957]. 49. Sermon notes: Christmas. – [ca. 1946-1957]. 50. Sermon notes: New Years. – [ca. 1946-1957]. 51. Sermon notes: Good Friday. – [ca. 1946-1957]. 52. Sermon notes: Prayer. – [ca. 1946-1957]. 53. Sermon notes: Faith. – [ca. 1946-1957]. 54. Sermon notes: Missions. – [ca. 1946-1957]. 55. Sermon notes: Mothers Day, Fathers Day, Childrens Day. – [ca. 1946-1957]. 56. Sermon notes: Resurrection, Ascension. – [ca. 1946-1957]. 57. Sermon notes: Second Coming. – [ca. 1946-1957]. 58. Sermon notes: Easter. – [ca. 1946-1957]. 59. Sermon notes: Galations, Ephesians, Philemon, I John, I Peter, I 60.Thessalonians, I Timothy, I Corinthians, James, Titus. – [1959-1967]. 61. Sermon notes: Genesis, Exodus, I Samuel, I, II Kings, Joshua, Ruth, Job, Prophets. – 1959-1967. 62. Sermon notes: Daniel. – 1959-1967. 63. Sermon notes: Snowflake. – 1959-1967. 64. Sermon notes: Tabor Home. – 1959-1967. 65. Sermon notes: Revival. – 1959-1967. 66. Sermon notes: Missions. – 1959-1967. 67. Sermon notes: New Years. – 1959-1967. 68. Sermon notes: Morden Mennonite Brethren Church. – 1959-1967. 69. Sermon notes: Street Ministry Morden. – 1959-1967. 70. Sermon notes: Prayer. – 1959-1967. 71. Sermon notes: Holy Spirit. – 1959-1967. 72. Sermon notes: Lindal Opening. – 1959. 73. Sermon notes: Psalms. – 1959-1967. 74. Sermon notes: Isaiah. – 1959-1967. 75. Sermon notes: Matthew. – 1959-1967. 76. Sermon notes: Mark. – 1959-1967. 77. Sermon notes: Luke. – 1959-1967. 78. Sermon notes: John. – 1959-1967. 79. Sermon notes: Acts. –1959-1967. 80. Sermon notes: Romans. – 1959-1967. 81. Sermon notes: Hebrews. – 1959-1967. 82. Sermon notes: Jude. – 1959-1967. 83. Sermon notes: Revelation. – 1969-1980. 84. Sermon notes: Revelation. – 1959-1967. 85. Sermon notes: Old Testament. – 1969-1980. 86. Sermon notes: Epistles. – 1969-1980. 87. Sermon notes: Romans and Hebrews. – 1969-1980. 88. Sermon notes: German. – 1969-1980. 89. Sermon notes: Acts. – 1969-1980. 90. Sermon notes: Matthew. – 1969-1980. 91. Sermon notes: John. – 1969-1980. 92. Sermon notes: Second Coming. – 1969-1980. 93. Sermon notes: Prayer. – 1969-1980. 94. Sermon notes: New Year. – 1969-1980. 95. Sermon notes: Easter. – 1969-1980. 96. Sermon notes: College and career. – 1969-1980. 97. Sermon notes: Ladies banquet. – 1969-1980. 98. Sermon notes: At Mount of Olives. – 1960. 99. Family Devotions. – [ca. 1962]. 100. Sermon notes: Wakeham (German). – 1961-1963. 101. German Sermons. – [196-?]. 102. Sermon notes from Horndean and Boissevain. – 1975, 1981. 103. Sermon notes from Lions Manor. – 1973-1975. 1.Sermon notes from Westwood Community Church. – 1976-1986. 2. Sermon notes from North Kildonan MB, Great Falls, Central MB, Woodlands Camp, Salem. – 1976-1981. 3.Sermon notes from Headingly Jail. – 1973. 4.Sermon notes from Heritage Lodge. – [1981?]. 6.Notes on sermons. – [19--]. 7.Sermons from Fork River and Winnipegosis. – 1967-1969. 9. Undelivered sermons. – [19--]. 32. Diary in Donwood Manor. – 1992-1995. 33. Marie’s conversion story. – [19--]. 34. Notes from Biblical Theology class, Mr. Nixon, Winkler Bible Institute. – 1937. 35. Marie’s radio broadcast talks and life lessons. – [196-? – 197-]. 36. “How we spent Christmas in the mission field. – [19--]. 38. Sermons – ‘Missions’ reports. – [19--]. 39. Object lessons. – [19--]. 40. Notes and program for the adult service at the World Day of Prayer. – 1973. 41. Notes and program for the adult service at the World Day of Prayer. – 1974. 42. Death certificate and obituary of Marie Wiebe by Phillip, her son. – 1985. 43. Photocopy of an excerpt from “No longer at arms length” by Peter Penner telling of the missions of Joe and Marie Wiebe. – 1987. 44. Correspondence to Joe Wiebe. -- 1953-1960. NP177-01:1Teen Noordenbus. - 1989. - 9x13 cm [col.]. This picture is of Teen Noordenbus kneeling in front of a geranium patch outside a house. Teen was Joe Wiebe's first convert in the Ashern area. NP177-01:2Teen and Hugh Noordenbus. - [1989?]. - 9x13 cm [col.]. summers day. Teen and Hugh are in the centre of the photo.